One of the brew pot enhancements I’ve been eyeing for a while is a sight glass, but it didn’t seem like something I felt like tackling. Then, I recently ran across the website BrewHardware.com. They had a really nice looking weldless sight glass kit and after watching the install tutorial video, I decided to order one and give it a try. At under $30, the price wasn’t bad either. I didn’t happend to have a step drill, so I picked one up off the website at the same time. The instructions suggests getting the hold as low as you can, while staying on the straight vertical side of the pot. The very bottom of my pot curves in a bit, so I used a straight edge to find the end of the curve, and marked the pot there with a sharpie. I then measured the suggested 5/8″ up from there, and marked the center of my hole. I had a bit of an issue getting the pilot hole started with the drill bits I had on hand, so I had to run out and grab a colbalt drill bit. Once I got that started, the step drill and a bit of cutting oil cut the required 9/16 hold perfectly. 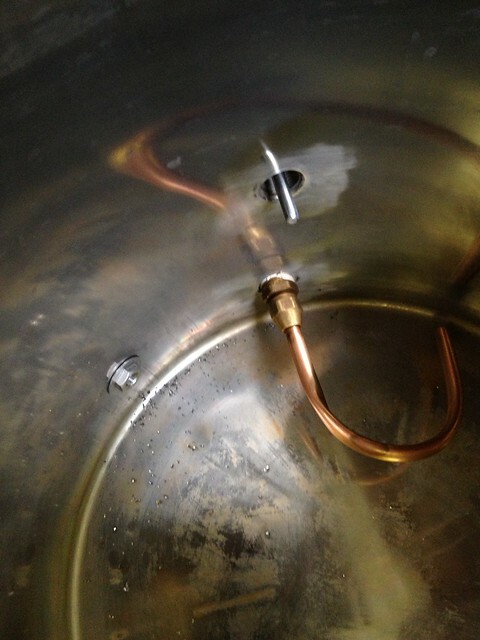 After cleaning up the hole, I test fitted the elbot and tube to the pot, and marked where I wanted to cut the tube, as it extended beyond the top of the pot. Using a tube cutter, I was able to cut the majority if the way through the tube, and then snap it cleanly off. 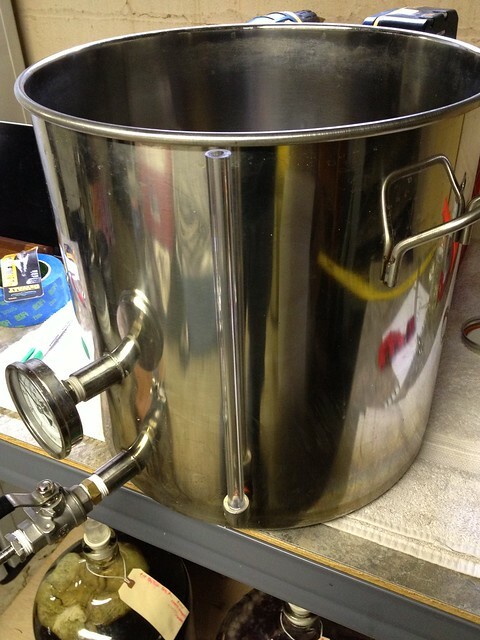 I was then able to refit the sight glass and hardware onto the pot, and then used a level to get the tube straight vertically. 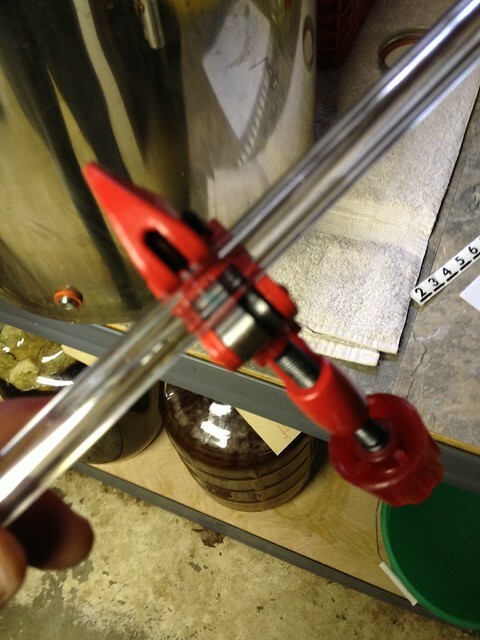 I was then able to mark the hold for installing the eyebolt that holds the top of the tube straight. After installing the eyebolt, I then refit everything and tightened all of the fittings. A silicon gasket seals the outside of the hold from leaking, so I made sure that was slightly crushed to seal everything up. 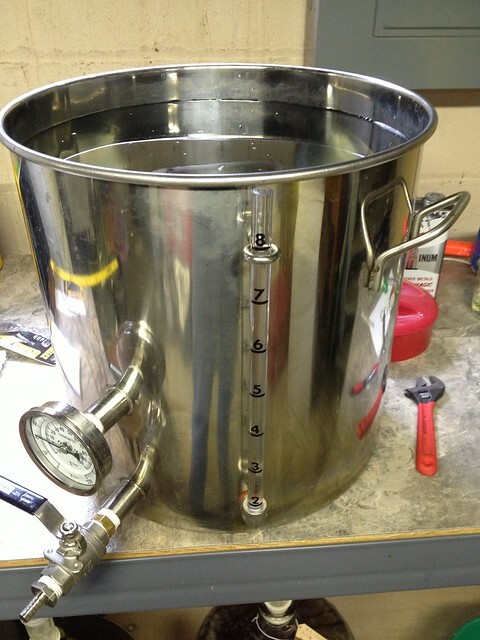 I then filled the pot up one gallon at a time, and applied the included vinyl calibration marks, indicating each gallon level. Was able to use this time to check for leaks, and everything looks good. 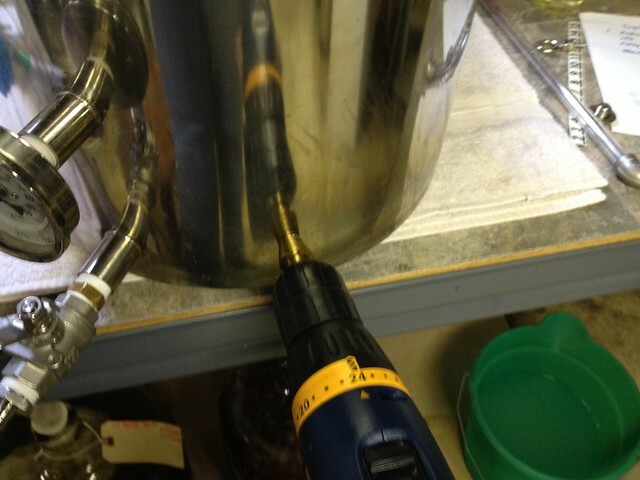 This will be a nice feature to have on the brew pot for future brew days. You are currently reading Brew Pot Sight Glass at Shue's Brews.